Mark Youngblood stood in a hole almost as deep as he is tall. His blue eyes, which sparkled with excitement, were just visible above the ground level. “Can you get me a screwdriver?” Youngblood shouted up to his friend and digging partner, Brian Mann. Mann ruffled through his tools and handed a screwdriver down to Youngblood, who disappeared once again into the hole. While digging, Youngblood noticed a change in the soil type, which could be promising, so he set aside his shovel to delicately chip away at the ground with a screwdriver. In Colfax, on this chilly morning last October, I was among the half dozen bystanders who formed a circle around the hole. We hopped from foot to foot to stay warm, clutching travel mugs full of coffee. No one wanted to go inside to warm up and risk missing the moment Youngblood found a treasure. 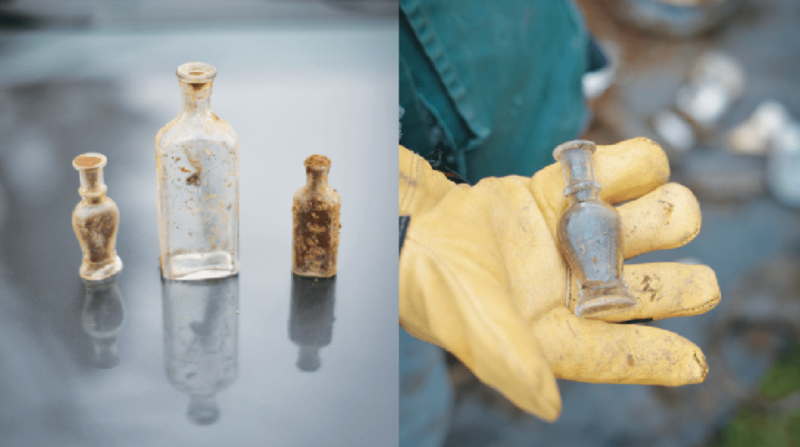 It was Youngblood’s and Mann’s glass bottle collecting hobby that brought them from White Bear Lake, Minnesota, to Colfax to dig up old outhouse pits. The two men are avid antique bottle collectors, specializing in bottles produced around the turn of the 20th century. Instead of today’s adhesive labels, many bottles had the company’s or pharmacist’s name embossed right on them. Since each bottle was handmade, they were often unique shapes as well, including the so-called coffin-shaped bottles. These old bottles are fragile, elaborate works of art. You may wonder why the two men weren’t at the antique shops in Menomonie or scouting out yard sales. 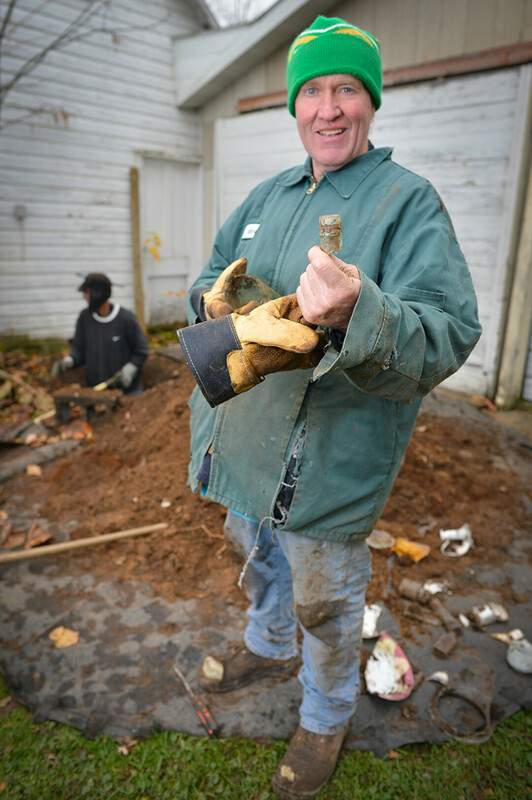 Youngblood and Mann know the best bottles, and some of the rarest bottles, have ended up as part of unintentional time capsules, several feet beneath the ground. Besides the obvious use, outhouses were also where people dumped their trash. In the days before weekly garbage and recycling pick-up, anything that couldn’t be reused or burnt was often tossed down the outhouse hole. To find new bottles to add to their collections, Youngblood and Mann make a deal with property owners. They’ll locate and dig up old outhouse pits, and in exchange they get first dibs on whatever they dig up. After years of doing this, Youngblood and Mann are selective about what they keep, and they usually have a specific bottle or bottles in mind before a dig. They are especially interested in bottles from local pharmacies and beverage companies. In their quest, they have dug up pits stretching from Brainerd, Minnesota, to Eau Claire, and they have found everything from false teeth to ham bones to marbles. Broken plates and damaged metal pots are also common. The two joke that they know they have found a bachelor’s outhouse when they find chicken and ham bones, and whisky bottles. This endeavor isn’t nearly as gross as you’d imagine, as human waste decomposes in a short period time. However, one element of human waste that doesn’t disintegrate are fruit and vegetable seeds. Since the human body doesn’t digest seeds, and seeds do not decompose, they remain in the soil. Over the decades, after this particular outhouse pit was closed up, the soil settled and the seeds ended up clumped together. When Youngblood raised a shovel full of seeds for us to inspect, we huddled around, captivated by the diet of an early Colfax resident. 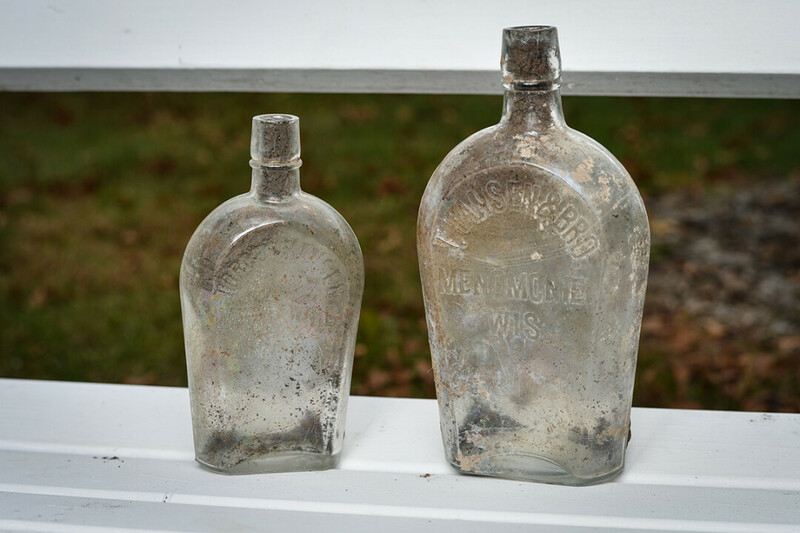 During last October’s dig in Colfax, Knutson hoped that they would unearth more bottles from Ole Noer’s pharmacy. According to Knutson, Noer ran a pharmacy in Colfax from 1896 to 1918. Noer’s son and grandson would each eventually take over the business, which closed in 1990. 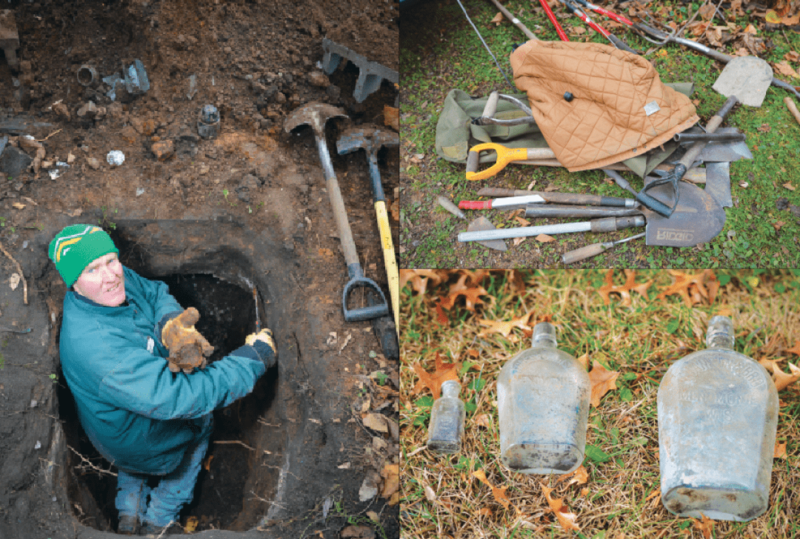 In prior digs two intact Ole Noer bottles had been unearthed, but one was later accidentally broken, making that particular bottle the Holy Grail of today’s dig. 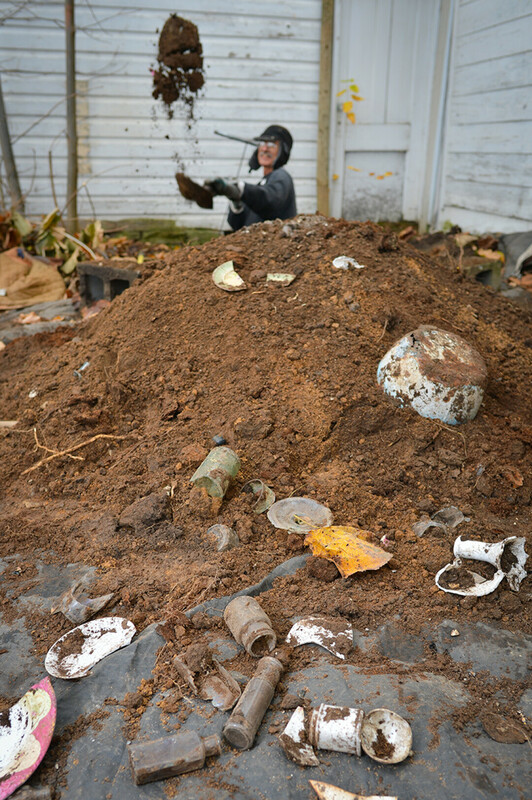 And now, decades – maybe even a century – after this outhouse pit was closed up, Youngblood and Mann have unearthed its contents. On a blue tarp next to the hole was everything Youngblood and Mann had dug up so far, souvenirs for any of us bystanders to take. Among the shovelfuls of dirt were perfume bottles, ham bones, broken china plates, and even an opium pipe. They were lots of bottles, but none were what Youngblood and Mann are after. After many years of collecting and limited storage space, they are choosy about what they bring home. On his cellphone Knutson displayed a photo of some of the items he has taken home from digs in Colfax, including a washstand pitcher and bowl in great shape, and a pile of ceramic doll heads – always just the heads. What’s the most unusual item found in Colfax? “A small handgun. It was all rusted, but I sure wonder what its story is,” Knutson says. The cold wind got the best of the bystanders that morning, including me. We sorted through the dirt and each chose a token to take home. I selected a small graduated medicine bottle that fit easily in the palm of my hand. It was devoid of any pharmacist or brand markings, but the fact that it was over 100 years old enthralled me, and I carefully placed it in my purse. As we all walked back to our cars, Mann jumped into the hole to take a turn at digging, still in pursuit of one of Ole Noer’s bottles. The two are enthusiastic about their hobby, and cold weather does not deter them. 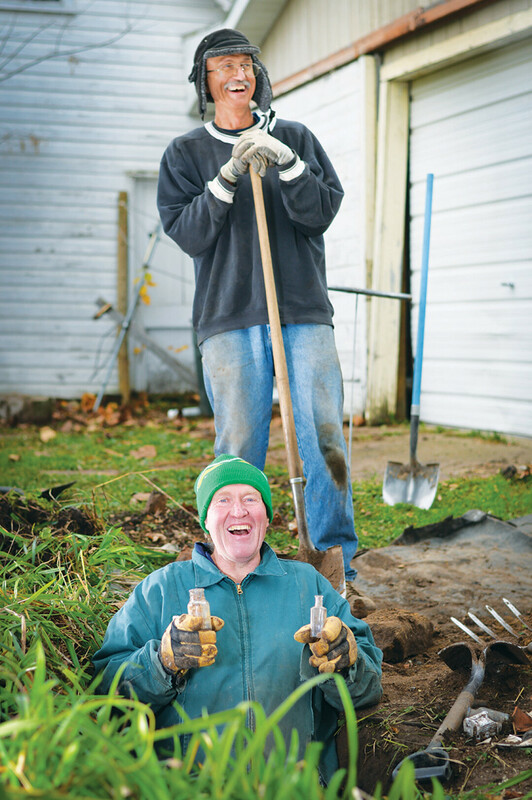 Throughout the years, Youngblood and Mann have dug pits in every month, although some winters are more amenable than others. If they have a pit they can’t dig in warmer weather – their summer weekends quickly fill up with digs – in the late fall they’ll lay down tarps to keep the ground from freezing solid. In the winter, if it’s not too brutal, they return to dig that spot. Later that day, I received an enthusiastic phone call from Youngblood. The duo’s persistence in Colfax paid off. While another Ole Noer bottle remained elusive, they found an embossed bottle from Carl M. Hvambsahl’s pharmacy in Eau Claire. This was a rare and unexpected find, in excellent condition. The long drive to Colfax was worth it. The Chippewa Valley’s ground doesn’t always yield its history so easily. A few weekends prior to the Colfax dig, Youngblood and Mann were invited by volunteers with the Downsville Community Museum to do a dig in the village. Before the two do any dig, they first scout out the land for probable outhouse sites. The two men are adept at looking at the ground for any disturbances that may have occurred over the years. Then they use metal probes in various lengths to test the ground. The probes, which the two make themselves, are shaped like a “T.” The hollow handles allow the men to feel vibrations when they hit something buried in the dirt. Youngblood and Mann probed several yards in Downsville with no luck. Using their shortest probes, they hit bedrock. They even went to the site of the old schoolhouse, which today is a private residence. The actual outhouses are long gone, but the pits are lined with rock, which made them easy to identify. Their probes slid easily into these patches of ground – too easily. While there was no bedrock in these pits, there was also no trash. Glancing out at the steep riverbank, Youngblood spotted a “No trash dumping,” sign. “I know where people probably dumped their trash,” Youngblood said as he pointed to the sign. While the medicine bottle I took home from Colfax is no sought-after collector item, it fascinates me to this day. I have it displayed, and whenever I look at it, I wonder about the original owner. Was she another Chippewa Valley mother, dispensing medicine to her children for a disease that has long since been eradicated? Or did hold some turn-of-the-century “tonic”? I’ll never know for sure, but it is an exciting piece of Chippewa Valley history, found in the most unexpected of places. Treasure hunting opportunities aren’t limited to privy pits. Kenneth Briggs is a long-time metal detecting enthusiast and operates Ground View Metal Detector Sales & Rental in Chippewa Falls. Briggs frequently scouts out local street and sidewalk tear-ups, chronicling his finds on his Facebook page. As a retired deputy sheriff from Chippewa County, local law enforcement has called on him to help recover evidence. Briggs enjoys sharing his hobby with others. Besides helping budding metal detecting hobbyists get set up with the right equipment, he periodically offers classes on metal detecting, including code of ethics and proper digging techniques. Briggs stresses that obtaining permission before metal detecting is key, even in public areas such as parks or schools. He is currently finishing up writing a book, Treasure Hunting Street and Sidewalk Tear-ups in Wisconsin.